Get 35% off products authored by Bonny Pierce Lhotka. Get an Extra 20% orders of 2 or more scripting titles. Get 35% off Best Interface Is No Interface Book By Golden Krishna. Save 35% On Jay Maisel’s Bbook, Light, Gesture, and Color with code. eBook Deal of the Week! Get 38% off Adobe After Effects CC Classroom in a Book (2017 release). 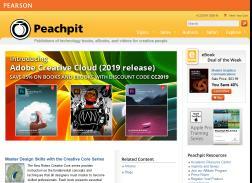 Save 35% on The Adobe Photoshop CC Book for Digital Photographers (2014 release), By Scott Kelby with Free Shipping. Free Creative Edge Trial with Purchase. 35% Off Learn to Code HTML and CSS: Develop and Style Websites Books With Code. Save 35% on Adobe Photoshop CC Learn by Video (2014 release) By Kelly McCathran with Free Shipping. Free Creative Edge Trial with purchase.